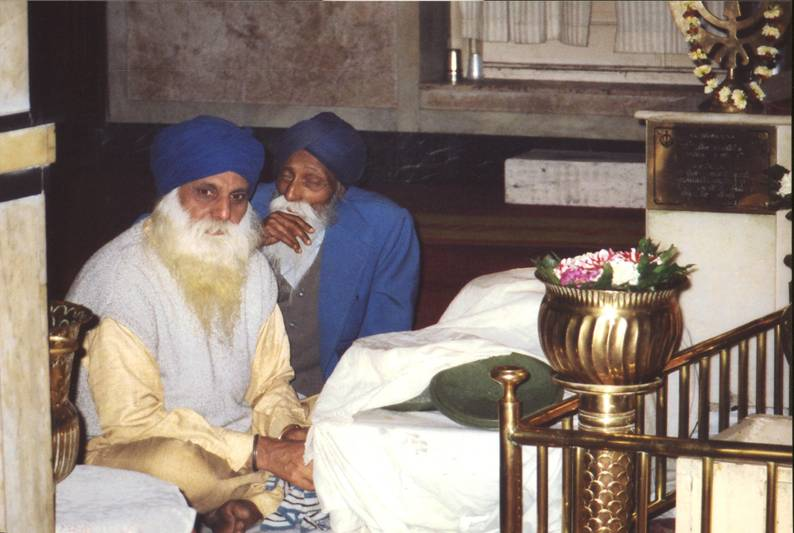 The two Granthis, Sikh officials, in the temple at Kolkata. Sometimes, for most congregational occasions the Granthi reads from the Guru Granth Sahib. While this religion was taking root, the Mogul (or Mughal) Empire was being established in India, and this led to conflict between Hindus and Moslems. Guru Nanak, while bathing in the River Bein, received a call from God. God offered him the cup of devotion to the Name, from which he drank, and, coming out of the river he said, “There is neither Hindu nor Moslem. God is greater than the divided opinions of religions.” Amrit, the nectar of immortality, is sacred and is used in ceremonies held for initiation into the Sikh community. Of the 10 Gurus, Guru Nanak is the most highly revered. Guru Nanak is usually portrayed in saffron-coloured robes and a shawl, wearing a turban and halo, a long white beard, a fakir’s necklace, prayer beads in his hand and draped on his turban seated cross-legged under a large tree. On his sole is a sign indicating his exalted status. 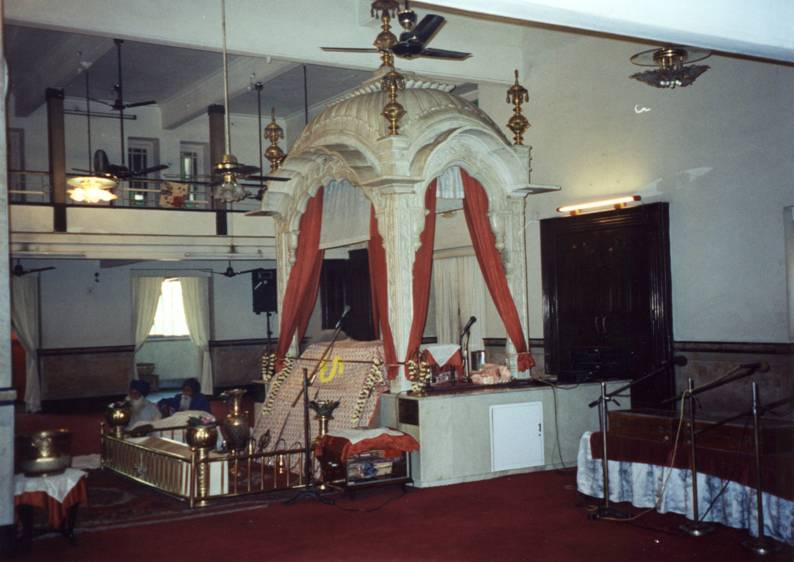 India – Kolkata – Interior of the Sikh Temple and the Throne (Manji), where the holy book is kept. The Gurus in Sikhism are not, as in other Indian religions, only guides or spiritual visionaries, but also they are leaders of the Sikh community. In choosing a successor to Guru Nanak, a pattern for Guruship was set which is based on commitment in preference to kinship, and rather than a son, a disciple was chosen. The 3rd Guru inaugurated the rituals for birth and death, the 4th Guru established the Sikh holy city of Amritsar. The 5th Guru combined the hymns predating him with his own, prepared the sacred text Guru Granth Sahib and built the very holy Golden Temple in Amritsar. The 10th Guru, Guru Gobind Singh is the most highly revered after Guru Nanak,.and.founded.the.order.of.the.Khalsa.Brotherhood. Khalsa was founded as a stand against the persecution suffered at the hands of the Mogul authorities, and its object was to forge a loyal and fearless community possessing a strong identity. When in the 17th century Guru Gobind Singh established Khalsa, he called for all Sikhs to adopt five symbols. These were in order to underline the equality and unity of all Sikhs. As a symbol of God’s will they were not to cut head or body hair, but to wear the turban to cover uncut hair. They were to wear a comb to symbolize personal care and cleanliness, they were asked to carry a dagger to show their determination to defend the truth and to resist all evil, and to wear a bangle as a symbol of responsibility and of their unity with God, and fifthly, to wear kacch, an undergarment indicating moral strength. Guru Granth Sahib must be instated at the Sikh temple, gurdwara, and honoured with great reverence. However, it is not the sacred book itself that is worshipped. This is covered with cloths and garlands, and a Sacred Whisk made of the tail hair of the yak in a holder is waved over it. This is to show the respect in which God and his teachings are held. Offerings brought to the temple are placed before the Throne (manji) where the Guru Granth Sahib is installed. Milk and fruit, or money for the collection box are typical offerings. There is a Sikh tradition of being a saint-soldier, and it is a Sikh belief that such soldiers will be rewarded in this world and in the next. When the Sikh male and female children reach puberty, a ceremony is held in which they are initiated into Khalsa. When Guru Gobind Singh announced that no other Guru after himself would be appointed, he stated that from then on, the immortal Sikh Guru was the sacred book named Guru Granth Sahib. After placing their offerings, the worshippers withdraw without turning their back on the sacred book, and all are barefoot, their heads covered. On the birthday of certain Gurus, the holy book is paraded ceremoniously through the streets. With the Sikhs there is no special class of clergy. Unlike many other religions, all adults, both men and women are permitted to conduct religious ceremonies. 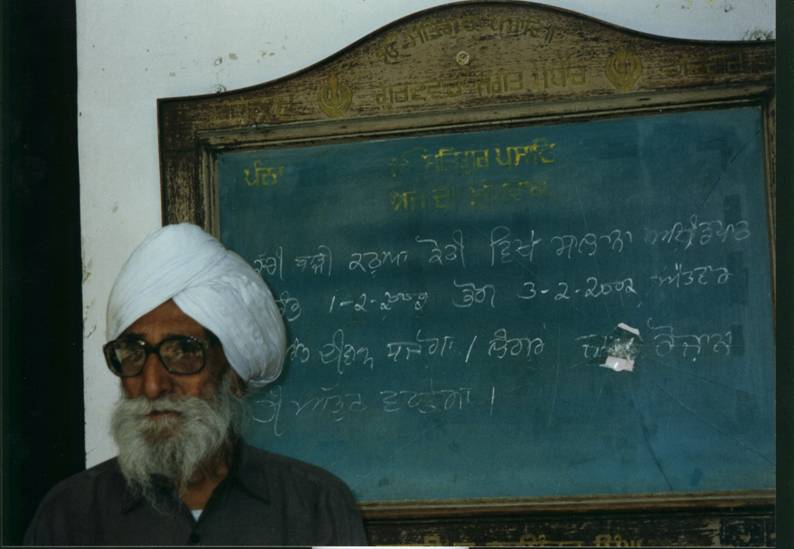 However, in religious ceremonies where reading of the holy book is required, occasionally a Sikh official given the title of Granthi reads the text. Also, the care and maintenance of the temple are in the hands of a Granthi. The symbol of their religion and the Sikh’s most important place of worship and of pilgrimage is the Harimandir, the Golden Temple at Amritsar in the Punjab. The land for the site was a gift from the Emperor Akbar and it is where the Guru Nanak is thought to have conducted his meditations. The temple was intended to be open for worship to all, irrespective of caste, gender, colour or nationality. With its four entrance gates, open to members of every social class, the temple’s sacred pool is known as the Lake of Immortality. The Sikh’s sacred book is placed in the temple at 5 o’clock every morning. The temple has been demolished and rebuilt several times. The most recent damage was done in June, 1984. The Sikhs were demanding recognition of their autonomy within the Indian Federation. The resulting conflict, when the Indian Army carried out a raid on the Golden Temple, reached a climax when, in October 1984, Prime Minister Indira Ghandi was assassinated by her Sikh guard. Sikhs observe the lunar calendar. The Sikh ideal of charity and service is reflected in the practice of langer, the eating of a communal meal during which each person gives according to his ability and takes according to his need. Free to all who come, regardless of caste or social status, the vegetarian meal provided served as a gesture made to oppose the caste system in which communal eating was restricted. All who attend must sit on the ground to emphasize their equality.